16 garments and 8 accessories for men! 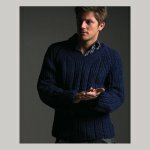 Queensland Collection 9 is a really beautiful book featuring around twenty designs for jumpers, cardigans, vests, hats and scarves for men. Like Erika Knight, Jane Ellison’s designs are just a bit classier than what you might find in general pattern books. Probably aimed for the younger man, as shown by the twenty-something models, but most of the designs are actually fairly classic so I think they would suit a man of any age really. Even better, she has XS sizes! The patterns are designed for an American yarn range from Queensland Collection from DK to Aran weight, but you could easily substitute other yarns. I reckon Jo Sharp Silk Road DK and Aran (or Morris & Sons Woollahra) would easily substitute for the Queensland Collection Kathmandu DK and Aran. 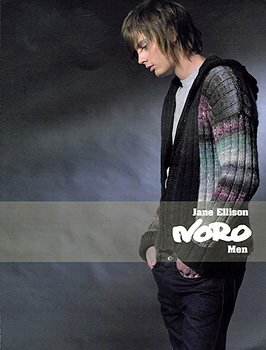 The second Jane Ellison book is Noro Men featuring designs for the wonderful Japanese yarn Noro. I always think of Noro as being just for accessories like scarves, but this book opens up more possibilities like jumpers, vests, hats and socks.